Josh, how do I thank you? I was worrying endlessly until you set up our plan. I don't even think about my exposure any more. No professional or business person should be without a solid plan and I know that no one could have done as good a job as you did or anyone who is as accessible as you are. You are not the first asset protection attorney I have ever spoken to but you are the first one who is truly an expert in the field, made sense and gave me the personal service I need. You have me as a client for life. Josh - There is no one more qualified that you are to take care of asset protection. Instead of dealing with a big faceless firm I deal directly with you. You protected my practice and made sure I have a secure plan. I tell everyone that I highly recommend Josh Bennett. Josh: You are one of very very few people that I trust completely. You took care of a problem (that I should have planned for long ago) for our family and made sure that we are well protected now. I lost a good deal of sleep about my money before I met you and I sleep like a baby since. 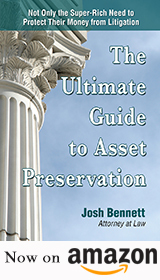 I recommend that anyone with a solid savings meet only with Josh Bennett about protecting it. Dear Josh - All business people have exposure. Before having you set up my asset protection plan I met with others who seemed to double talk. You are the only one who seemed to actually listen to me and you sat down and explained exactly what I needed to do and presented a plan that works for me, for my business and for my family. I feel protected now. Josh - As you know my colleague was sued and his practice insurance did not come close to protecting him. I tell every doctor I know that they need to see you to learn how exposed they are and how to protect what they have. I am glad I found you before I had a problem. Josh - I had a bogus law suit against my businesses and against me personally. But you had protected my assets years before and so I called you and the entire matter shrunk to almost nothing. It could have been a disaster. Thank you Josh. Q. What does "protecting assets" actually mean? A. "Protecting assets" means protecting your personal assets from creditors and lawsuits. It is a simple matter of being responsible for maintaining your wealth. The alternative is to take the very real risk that a careless business decision, a traffic accident, or someone filing a lawsuit against you for no valid reason will deprive you and your family of all the money you have spent a lifetime accruing. Q. Why should I fear a lawsuit? A. American society has become a litigious one, a popular way not only for the people who file suits to become wealthy, but for their attorneys as well. Lawyers work on a contingency basis, collecting one-third to one-half of the assets they get for their clients. This is a huge incentive for a lawyer to work very hard to get as much of your money as possible in a lawsuit. Many wealthy individuals rank the fear of lawsuit as one of their biggest financial concerns, and with good reason. Q. How does an individual, partnership, PA, or corporation legally avoid this problem? A. Through appropriate, knowledgeable, legal asset protection planning, you can effectively protect your assets from creditors and potential lawsuits. Q. What is meant by appropriate asset protection planning? A. Appropriate asset protection planning is the use of practical and sophisticated business and estate planning to place your assets safely and securely out of the reach of others. Q. Isn't this the same as hiding assets? Does it involve fraudulent secret bank accounts? A. Absolutely NOT. It is a legitimate system of proven planning techniques that works completely within the law. Q. Why don't I simply hide my assets in a Swiss bank account? Wouldn’t that protect me? A. No, it would not protect you. Investing funds in any foreign account is not guaranteed to be a worthwhile investment. Any asset protection plan that serves to hide assets or is dependent upon secrecy of any sort cannot protect you. For one thing, it is illegal. All US taxpayers are required to report everything in which they have a financial interest, including but not limited to signature authority and foreign accounts. When you meet this requirement, a litigator can and most likely will obtain this information. And, when a judgment issued against you, the court can order you to bring all of those funds back into the US, making these assets available to satisfy the judgment. If you attempt to keep these assets hidden, you will be violating the law and penalties may apply. Q. I gifted all of my assets to my spouse, so I have nothing to worry about, right? A. Wrong. This is a temporary fix and a poor one as well. First, by doing this, you lose control over your assets. Second, your spouse can be sued and lose, putting all of the assets you were attempting to protect at risk. Also, think about what would happen were there judgments against you that could not be collected because you had no assets, and suddenly your spouse dies and all the money in your spouse's name is left to you? Now, all of those judgments can be collected, and you have lost a significant part, if not all, of your assets overnight. Q. I carry a huge multi-million dollar liability insurance policy, so I have nothing to worry about, right? A. Wrong. No policy we know of will cover you for intentional wrongdoing or punitive damages. Yet, both of these are common outcomes of lawsuits. Further, you may be sued for far more than the limit of your policy, and insurance companies have been known to go out of business. While these policies can offset your losses, and may be part of your planning, they should not be looked at as a complete solution when it comes to asset protection. In addition, if you have a properly executed asset protection technique in place, you may realize a large savings in insurance coverage. Often, this is enough to cover your cost of setting up an asset protection plan. Some clients have saved thousands or even tens of thousands per year in liability and malpractice insurance because, once our asset protection system is in place, they only need to carry a minimum of liability insurance. Note that no insurance policy can protect you if you have personally guaranteed a business loan and the business fails. And, insurance doesn't protect you if you are accused of gross negligence or recklessness. Plus, it doesn't protect you beyond the maximum limits of your coverage. Q. I have a living trust, so I have nothing to worry about, right? A. Wrong. The revocable living trust, when properly structured, is unquestionably a necessary part of proper estate planning. It will result in avoiding probate for the assets transferred to it. However, this will not protect you from your creditors. If you lose a lawsuit, the court can and likely will issue an order to revoke your trust in order to pay your creditors. Q. My understanding is that, if I protect my assets, there is less of a chance that I will be sued in the first place. Is that true? A. Absolutely! Many people mistakenly think that insurance is the best thing to protect them from a lawsuit. In fact, knowing that you have insurance coverage actually encourages people to file lawsuits against you, because they know that you will be able to pay them lots of money if they win in court. On the other hand, proper protection of your assets will often deter someone from filing a lawsuit. When a lawyer examines your case and sees that the chances of collecting are slim, even if a judgment is awarded, they will be reluctant to accept the case against you. Collecting the judgment is the only way in which these lawyers get paid. No collection equals no fee, which equals no case. Protecting your assets makes you appear a very unattractive defendant. Ironically, liability insurance can often be more expensive than the cost of protecting your assets. Protecting your assets may even reduce or eliminate your liability insurance coverage needs. Q. What is involved in asset protection? Is it really cheaper and better than the alternative? If so, why doesn't everybody protect their assets? A. Quite simply, most people do not know how to go about protecting their assets. There are a number of methods of protecting assets from creditors and lawsuits. The simplest and most effective method is to establish an offshore trust. An offshore trust can be set up to work just like a checking account. When someone opens an offshore trust, naming themselves as beneficiary, the assets stay safely tucked inside a local United States bank and the beneficiary can conveniently write checks or make deposits for any amount at any time. However, the trust is subject to another country's laws. These laws make it virtually impossible to collect debts from the trust or successfully sue the beneficiary. In order to attempt to get their hands on the assets protected by the trust, someone would have to hire a lawyer in the country in which the trust is established (where laws prevent lawyers from working on a contingency fee). They must then convince a court in that country that it has the authority to hear the case, even though the case involves conduct that occurred in the United States. Even if they somehow succeed and the case proceeds, the person who filed the lawsuit will still have to contend with a law which forbids the court from awarding any of the money in the trust. Because it is so difficult—if not impossible—to get this money, very few people bother to try. Most will simply go after someone else instead and accept even the smallest settlement offer. Generally, the only way an offshore trust can fail to protect assets is when the beneficiary waits until after someone is already going after the money to set up the trust. As long as the trust is set up well in advance of any such dispute, then the trust beneficiary's assets will be protected. Q. Why would I want someone else controlling my money? A. No one else will control your money; only you—you are in full control of your money. You make the financial decisions, and you write the checks. You have absolute power to remove and replace trustees, without cause. You have total power to veto any action of the trustee. Nothing can happen without your approval, without your signature. Q. Are there any tax consequences of this arrangement? A. No, nothing in your tax situation changes. Your income, estate, and gift tax situation remain exactly as they were before. Q. Can this ever be considered illegal? A. No, absolutely not. As long as asset planning protection is done in advance of any legal/liability situation, it is completely legal. Once creditors are after you, once a suit has been filed, it is often too late to protect your assets. Q. Where will my assets be located? A. The assets may be held anywhere you wish. They can stay right where they are now, even in your local bank. It is only the trust itself that is domiciled in an offshore nation. It is very important to ensure that the country selected has a strong economic environment, along with favorable laws, modern means of communication, and a stable political arena. That is why a large percentage of our firm is designated to fully investigate all current options and ensure our clients that the best location is always selected. Q. I am currently being sued. Is it too late to protect my assets? A. It is always best to plan in advance. The strongest protection can be afforded before creditors are on your heels. However, we have helped many clients after litigation has begun. A. Call the law firm of Josh N. Bennett at (954) 779-1661 to set up an appointment so that the best asset protection can be planned for your particular situation.